Please note: The digital edition does not include 2 of the 40 images that appear in the physical edition. Since the rise of Napster and other file-sharing services in its wake, most of us have assumed that intellectual piracy is a product of the digital age and that it threatens creative expression as never before. The Motion Picture Association of America, for instance, claimed that in 2005 the film industry lost $2.3 billion in revenue to piracy online. But here Adrian Johns shows that piracy has a much longer and more vital history than we have realized—one that has been largely forgotten and is little understood. Piracy explores the intellectual property wars from the advent of print culture in the fifteenth century to the reign of the Internet in the twenty-first. Brimming with broader implications for today’s debates over open access, fair use, free culture, and the like, Johns’s book ultimately argues that piracy has always stood at the center of our attempts to reconcile creativity and commerce—and that piracy has been an engine of social, technological, and intellectual innovations as often as it has been their adversary. From Cervantes to Sonny Bono, from Maria Callas to Microsoft, from Grub Street to Google, no chapter in the story of piracy evades Johns’s graceful analysis in what will be the definitive history of the subject for years to come. 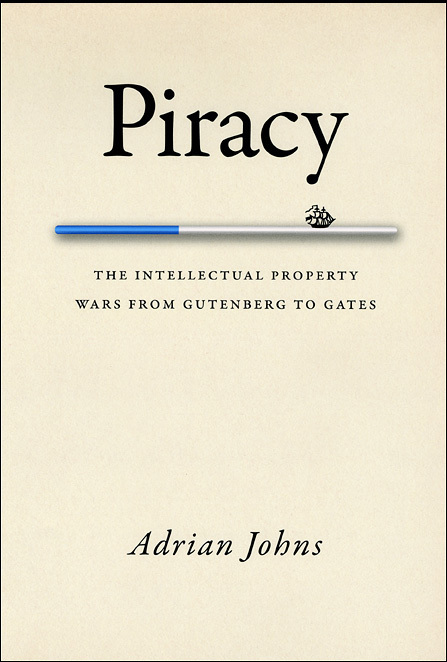 "In his invaluable book Piracy, Adrian Johns argues that the tendency of intellectual property battles to undermine privacy is not new. On the contrary, Johns . . . argues that ever since the medieval and Enlightenment eras, corporations have tried to defend their economic interests by searching for intellectual piracy in the private sphere of people’s homes. He says that all of our current debates about intellectual piracy—from Google’s efforts to create a universal digital library to the fight over how vigorous patents should be—have antecedents in the copyright wars of earlier eras." "Adrian Johns argues that piracy is a cultural force that has driven the development of intellectual-property law, politics, and practices. As copying technologies have advanced, from the invention of printing in the sixteenth century to the present, acts of piracy have shaped endeavours from scientific publishing to pharmaceuticals and software. . . . Johns suggests, counter-intuitively, that piracy can promote the development of technology. The resulting competition forces legitimate innovators to manoeuvre for advantage—by moving quickly, using technical countermeasures or banding together and promoting reputation as an indicator of quality, such as through trademarks. . . . The exclusive rights granted by intellectual-property laws are always being reshaped by public opinion, and accused pirates have lobbied against these laws for centuries."